^--- Just click that link, and look around blockchain.info for more about it. 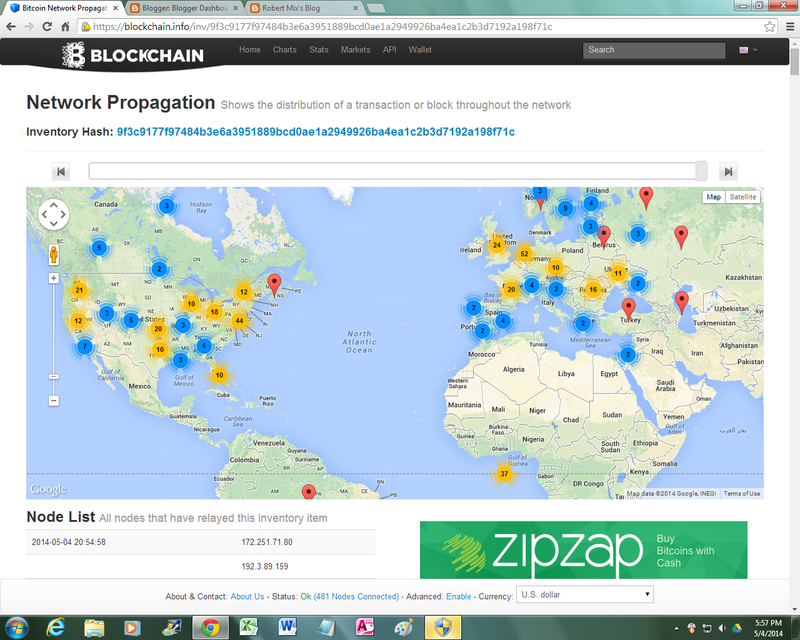 Note that Europe is also big in BTC, many nodes, also note there in the "Gulf of Guinea" near bottom right, that there are 37 nodes that relayed this transaction. Quick Contest: Why are there so many nodes there in the Gulf of Guinea? The winner gets 0.05 Bitcoin! The Winner is the first one to provide a plausible explanation by comment only here at my blog, so get going! 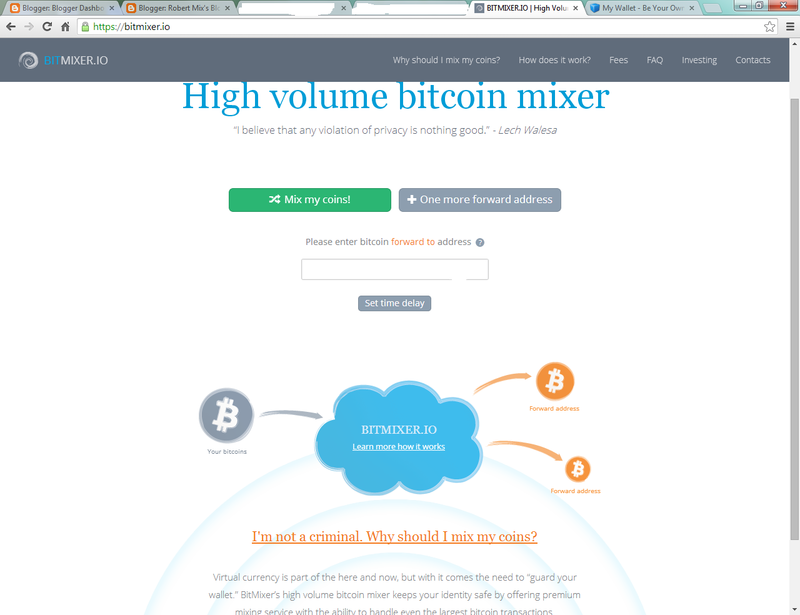 In recent days I have had the chance to try out two BTC "mixing services". In easy language, mixing services take the ID numbers of various peoples' Bitcoins "going in", and shuffle them together via one or more algorithms to make the origin of Bitcoins com "coming out" more difficult to track. The Blockchain, you will recall, is the public ledger of Bitcoin transactions. It is only "somewhat" anonymous, anyone's BTC wallet is posted there along with some details, as visible in the above million dollar plus transaction. blockchain.info is apparently NOT any kind of "official service" of Bitcoin and the Blockchain itself (there are very few "official anythings" with Bitcoin, it is a p2p network that no one runs), it is a free service that allows anyone to poke around some of the infrastructure of BTC. The service seems to be very respected by the Bitcoin Community, my source "Bitcoin Insider" had good things to say about them as I was learning how to perform basic tasks under his instruction. 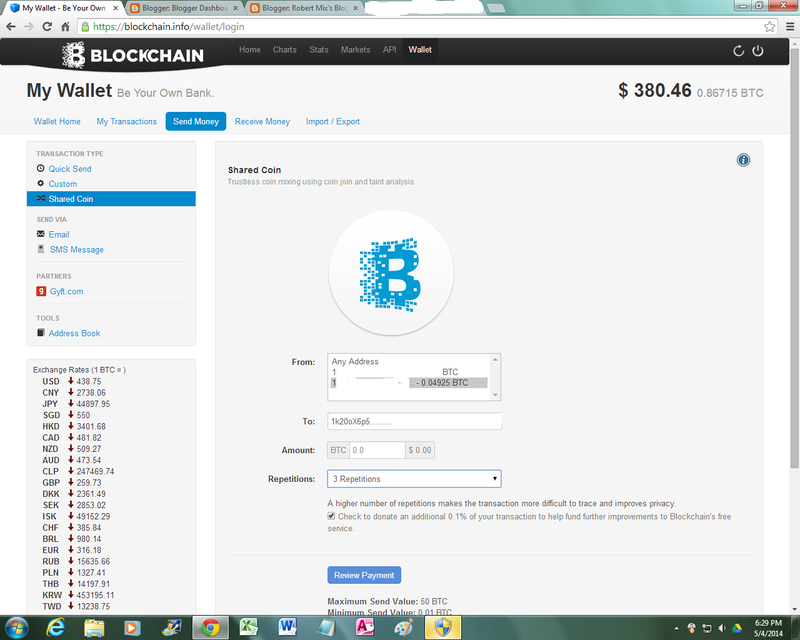 An option of using blockchain.info is included with the MuliBit Bitcoin client. "The data can be used to evaluate the anonymity provided by a mixing service." 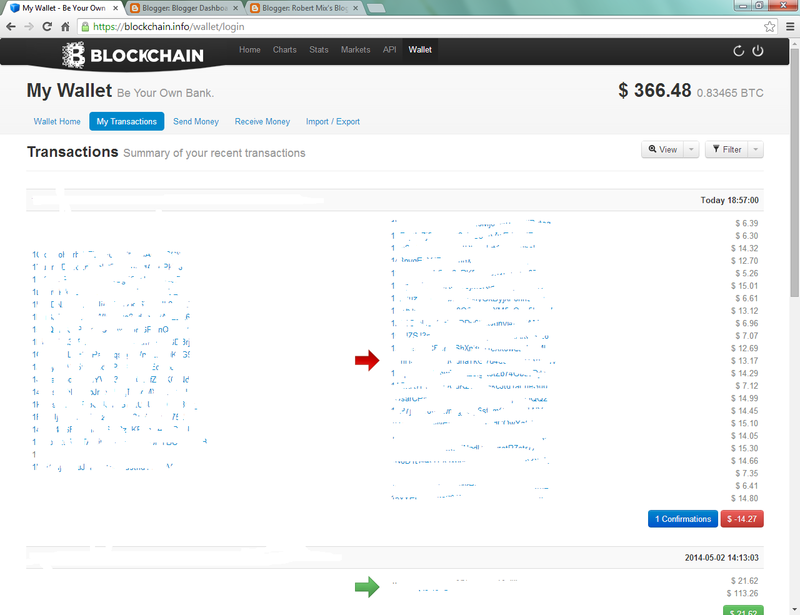 If you click that link, you will note a large number of wallets with 50% taint, a rather strong link (per sender -- notice many senders though -- so the transaction seems to be pretty anonymous), but you will also note a much larger number of wallets (from senders), making this transaction an even harder nut to crack... I am not skilled enough to make any further remarks about the "taint" of this transaction nor if the sender or receiver even used a mixing service. IMPORTANT DISCLOSURES! These are my experiences only! Your mileage may vary! Mixing BTC is at your own risk! What worked today might not tomorrow! I suggest sending very small amounts only as you get started and build confidence. I first tried out sharedcoin.com, a frequent advertiser at blockchain.info, and because they use the same logo of a capital "B" with pieces coming off, I inferred that they are affiliated. I also guessed that they were likely legitimate as they have been advertising there at blockchain.info for sometime. I would like to thank "Peter R" for giving me some instruction in first using this mixing service. -- Start by opening a new wallet at blockchain.info (unless, of course, you already have one). Seen by 7 peers. Appeared in best chain at height 299xxx, depth 1, work done 3436405. Total elapsed time: about 25 minutes. Of course, I have been writing this part of the article while mixing the BTC, but 25 minutes, perhaps up to 45 minutes would be about right. You then return to your original (sending) wallet. Then send your BTC to the "orange" wallet that bitmixer created for you. 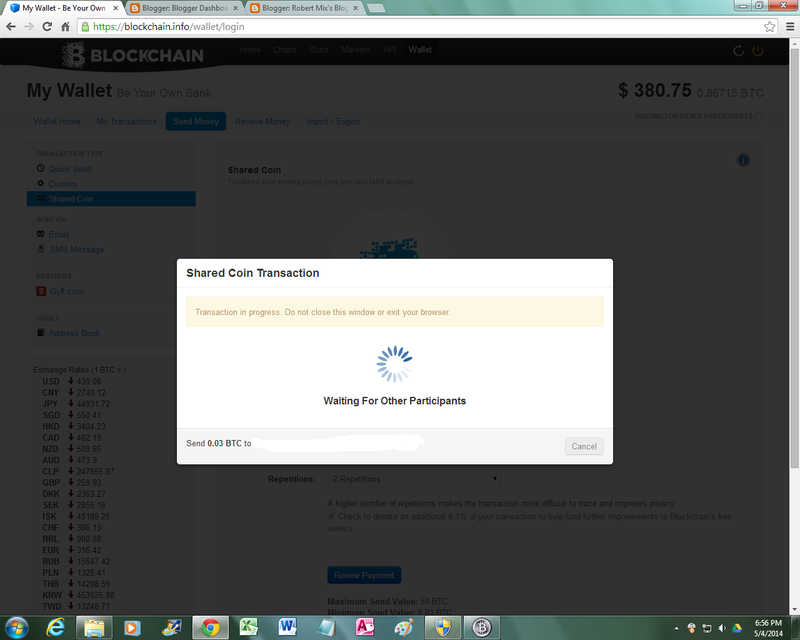 It has now been some 15 minutes, and my receiving wallet is waiting on confirmations. 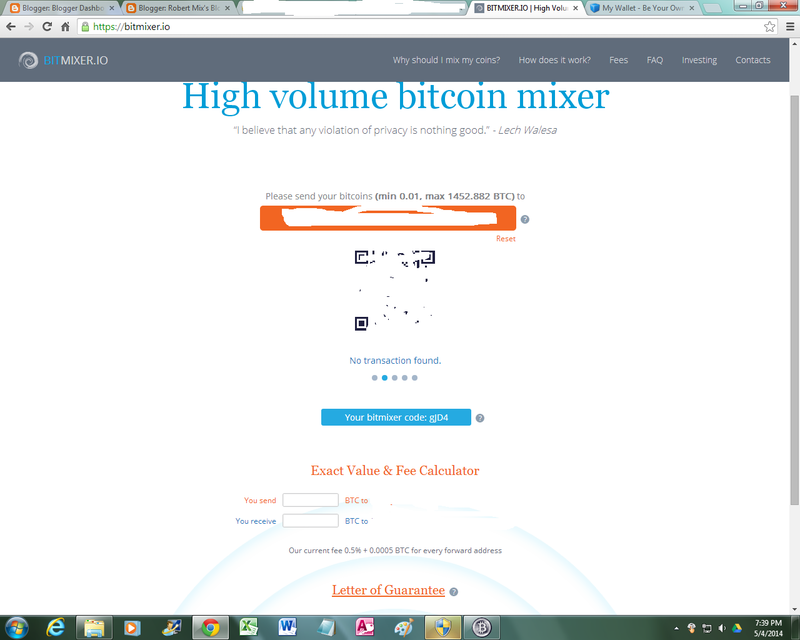 Last time I sent my BTC through bitmixer.io, it took some 35 minutes total. Update: This time it took almost an hour for everything to come through. Hey, now you know! Note that bitmixer gives you a 4-length alphanumeric code. This allows you to send more BTC to that same wallet address for 24 hours, the code ensures that none of your older (first transaction) BTC gets mixed in should you want to send more BTC within that 24 hour window. Look around the sites and FAQs of the mixing services for more information. Without doing any Googling, I'm gonna guess that the nodes populate the Gulf of Guinea disproportionately because it's an autonomous area with access to some low cost power - like offshore wind farms, thermal or methane. Is that close? Nope, good try, but no cigar. Because all the pirated oil money needs to be laundered. Alberto wins! I will try to send out the BTC today or tonight. My GUESS is that unidentified nodes trying to be quiet or secretive are those at "0" and "0". Alberto wins! That's my conclusion anyway having seen many of these kinds of maps. Congratulations. I'll try to send the BTC out later today or tonight. Keep coming back! My guess is that unidentified nodes that want to be quiet or secret are shown at "0" and "0". thanks Robert. i like the blog and also like reading your posts on zerohedge. Aaaaannndd..., they're off, as of now 3 confirmations on 0.05 BTC heading your way Alberto! Not sent through a mixing service, my wallet ID ends: .....5Ddn2iB, FYI. Hmm, how curious that the first relay was Vancouver, I do not live even close to there. Also, to cover your tracks better, feel free to delete your post w/ your wallet number. Oh, olvidaste platino..., pez !! got em, thanks again Robert. would have loved to see the gulf of guinea come up instead of vancouver, haha.